The News became sensational when public leaders attended the matrimonial ceremony held by the infamous corrupted businessman Sitaram Prasai few days ago. When a Photo Journalist belonging to 'Naya Patrika' Daily tried to take the snapshots of the event, he was snatched like Falcon to it's prey, and all his photos were deleted from his Digicam instantly. He was misbehaved,threatened,beaten and as a last resort, those goons deleted his camera contents thinking that was the best methods they could do to be safeproof. But do they know, they can't cheat the technology? I'm not trying to be political here but since, this is something related to Technology, i'm writing everything possible disclosing everything here. The very next day, the same journalist recovered the deleted photos from his DigiCam? and all the hypocrites are exposed on today's Daily. I'm going to show step by step procedures how to recover data from any media. First of all, i want to discuss about the Windows' deleting. When we delete files, it goes to recycle bin and emptying them, we assure ourselves it's deleted permanently. When we delete all files from Pen drives, Digicam etc using the same delete methods, we think they are gone but that's not true. We can still recover those files using special data recovery softwares. Windows reserves the byte location(space) as available where there used to be a deleted file. Using some softwares, we can get those deleted files on our service. 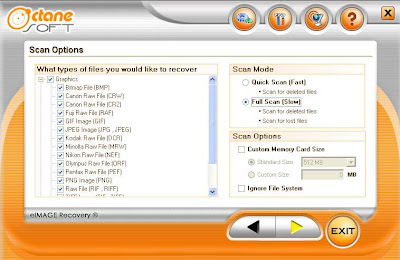 1) Recovering deleted Items: I'm going to take a help of very special software called eImage Recovery. There are hundreds of them in net but this one is my favourite. -Under the scan option, select all possible file formats. Under the scan mode, select "full Scan" and click next. -Now, it'll try to recollect all the possible files it could. 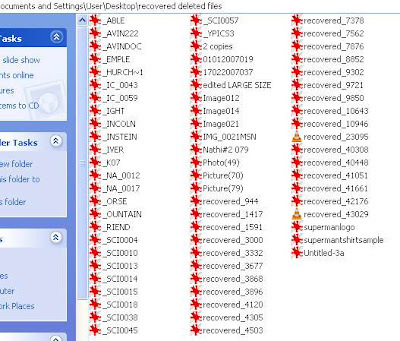 Once that's done, select all and click 'Save files' to save those recovered files on desired location. Now, these are the recovered files/images from my USB pen drive. 2) Is there any method to tackle this?? YES, we can permanently delete any files from any media. We've to go beyond the Window's Delete command. Now, permanently deleting files, it's not that hard. We again are going to take help of another software. The basic principal of these softwares are overriding the Byte location with bogus content or by simply deleting/renaming them numerous time rendering data to irrecoverable. There are couple of softwares to do this. My choice is File Deleter(userqwa:93776roxEdbyaCmE). Sure Delete is another similar application but this is freeware. In file delete, select the folders/files to delete and press the delete. It's that simple. Ehh horra? Alright, your excuse is fine heheehhe. Actually, I made the font black, but I don't really know what is wrong! Anyways, I will try and sort it out! And yeah, I know people find Himesh annoying, but I guess you either love him or hate him hehe. OMG! that's awesome! I like this programme lol. Maybe I should use it someday, if I accidently delete files I wasn't meant to! thank you friends for appreciating this post. You joining me in the countdown? Even though you don't like him!!! Awwww, so sweet of you! hehe! Its nice to have such an interesting article. When I went through the problem of data loss, I used hard drive recovery software to recover all my data . It is Stellar Phoenix Windows Data Recovery software.